Mainly applied in the laboratory for testing the materials'drying. It is the ideal model for exploring the optimal parameters in drying processing. This integrate and advanced experimental equipment is made by drying section, heating section & automation control. 1. All jointed corner is arc processing, and press forming by mold. So, it is without dead corner and easy to clean. 2. The special door and the hinged structure ensure the sealing effect, reduce pollution, avoid the door going down. 3. The vacuum nozzle and nitrogen export are equipped with filter can prevent the air rush into the material directly if the vacuum system failure. 4. The plate type heat exchange. The heating structure of outside frame can make the heating evenly. The internal temperature difference is small and the drying efficiency is highly improved. 5. 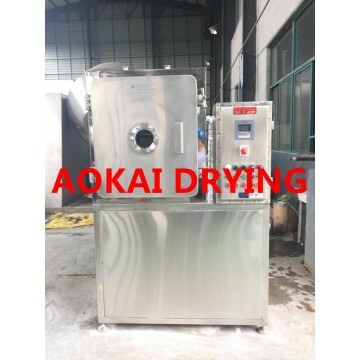 This equipment consists of a square vacuum dryer and hot water heating system composed of self-control, more convenient operation, small footprint. 6. This product is in accordance with the requirements of GMP. 7. Our company can provide the relevant documents and service supports of the GMP verification.